The key tips to running a successful California laundromat haven’t changed much over the years: keep your store clean and well lit, provide great equipment that helps your customers get their laundry done fast, and keep your machines maintained to avoid “out of service” signs. But your store could increase profits by expanding the services you offer your customers. Extend the utility of your laundry equipment past peak hours. Almost every laundromat has peak hours — generally evenings and weekends. And as a laundromat owner, you want to make the most of these busy times. You’ll equip your store with high-capacity, high-speed washers and dryers to enable you to serve as many customers as possible during these hours. When you offer services like wash & fold, commercial laundry, and delivery, you can extend the profit-making capabilities of your equipment past peak hours. During slow weekday afternoon hours, your staff can wash your wash & fold and commercial customers laundry — gaining your store extra profit! Laundry is a renewable resource. Your customers make more and more of it every day. By offering convenient laundry services, you can become part of their routine —removing the headache of laundry for your customers and gaining your store regular business. Your store already strives to make it as convenient as possible for your customers to get their laundry done, so why not take that convenience one step further and do their laundry for them? Wash & fold is a particularly valuable service for commuters who can drop their laundry off before work and pick it up after. And of course, you can use your store’s slow afternoon hours to launder your wash & fold customer’s items. Already offering a wash & fold service? Why not extend this to local small businesses? Many restaurants, salons, gyms, and any business whose employees wear uniforms will appreciate this service. In order to entice local businesses to your store, you could offer a commercial discount. Because commercial customers usually launder a high volume of one type of item — towels, tablecloths, uniforms, etc. — it will take less time to sort this laundry, reducing your labor costs, and allowing you to offer a discount. 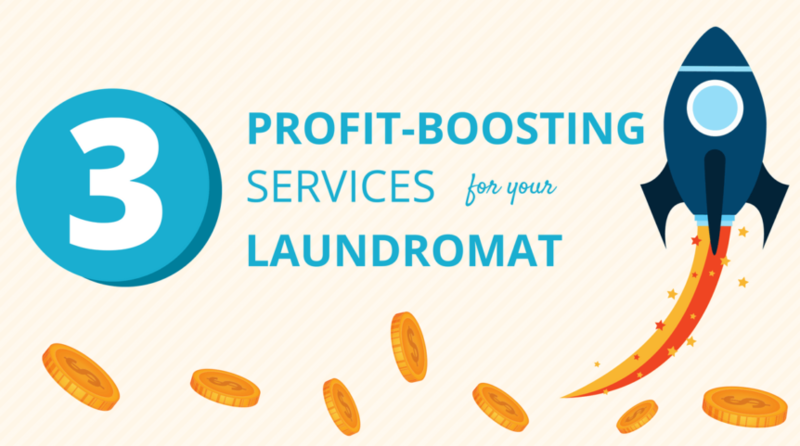 Want to set yourself apart from competing coin laundries in your area? A delivery service offers the ultimate convenience for your customers. They can already have groceries delivered to their home, so why not laundry too? Offering a wash & fold pickup and delivery service would provide the ultimate convenience for your busy customers, and generate a valuable additional income stream for your store.